Have you noticed that the days are getting shorter? Cookie and I are heading out the door earlier for our evening walk, and I’m scrambling to check off the summer recipes on my list while I still can. 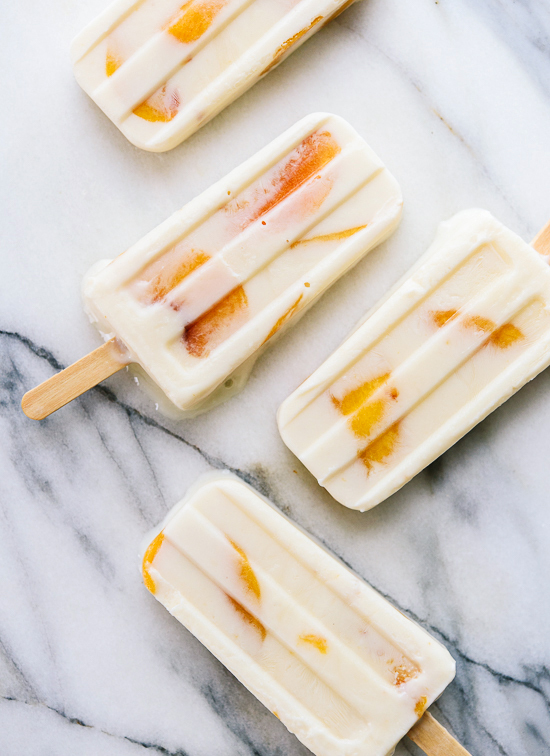 Peaches are so plump and sweet right now; popsicles needed to happen. 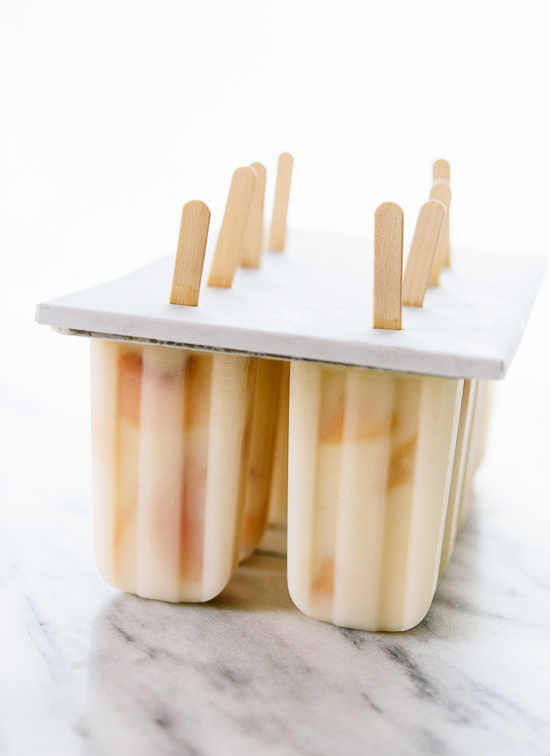 I killed two birds with one stone with these peach popsicles. 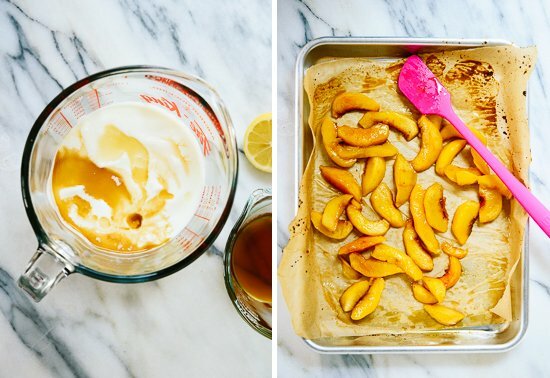 They’re super simple—consisting of roasted peaches, honey and yogurt—and they taste just like you’d expect. Delicious, fruity and creamy. 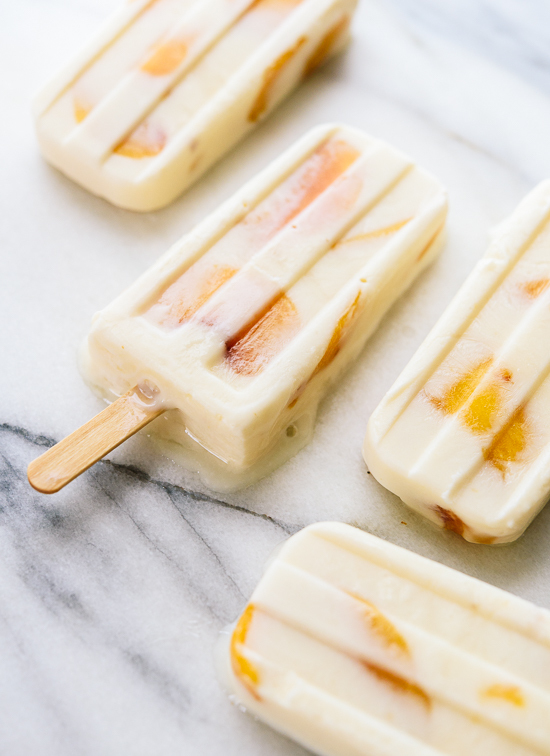 These popsicles are ultra creamy because I roasted the peaches into jammy submission, which reduces their water content while concentrating their sweet flavor, and opted for full-fat yogurt, too. Speaking of, every time I specify full-fat yogurt in a recipe, I get questions asking if you can use low-fat yogurt instead. If you use lower fat yogurt in this recipe, which has less fat and more water, you’ll get icier popsicles. That said, if you don’t share my totally bizarre, nails-on-a-chalkboard-like aversion to icy popsicles (also included: the sound of ice rubbing against ice, please tell me I’m not the only one), you can go ahead and make some with low-fat yogurt. However! If you’re worried about fat content, I would argue that a) these are reasonably sized, three-ounce treats and, b) full-fat yogurt still isn’t that high in fat or calories. I’m looking at the container right now and just about a third of the calories come from fat, which is nowhere near heavy cream and still less than your average cheese. It’s also very high in protein. For a dairy-free version, try substituting full-fat coconut milk for the yogurt. Before I go, I got the chance to talk to Gabriel of The Dinner Special the other day. He turned our conversation into a podcast and a YouTube video and transcribed it, too! You can listen/watch/read over here, eep! He has interviewed a ton of other bloggers, too, so you might find some new blogs to love while you’re there. 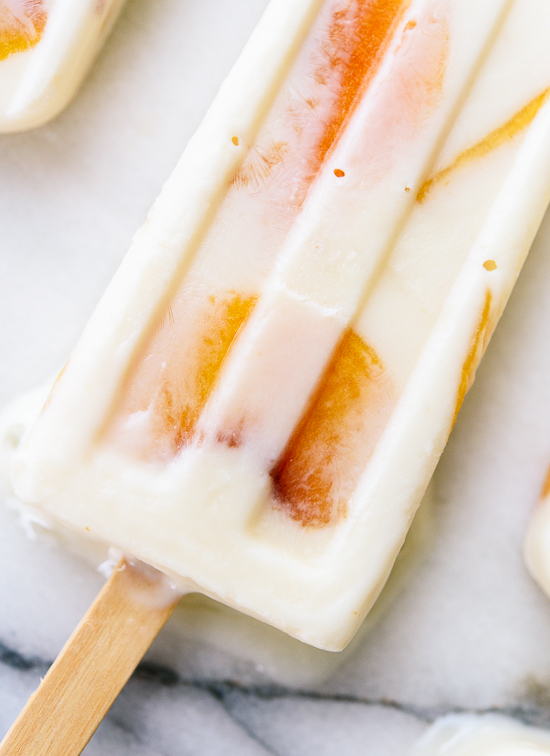 Honey-sweetened peach popsicles made with yogurt and roasted peaches! These cold, creamy treats are perfect for summertime. They’re healthy, too. Recipe yields eight 3-ounce popsicles. Preheat oven to 350 degrees Fahrenheit. Line a rimmed baking sheet with parchment paper. Transfer sliced peaches to the baking sheet and gently toss with 2 tablespoons honey and a dash of salt. Arrange the peaches in a single layer. Roast for 30 to 40 minutes, stirring halfway, or until the peaches are soft and juicy (watch the edges in particular). 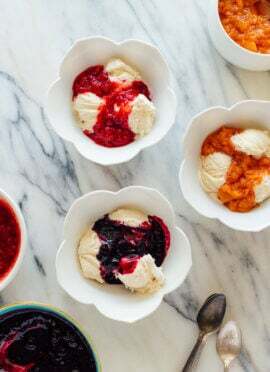 While the fruit is roasting, blend together the yogurt, ¼ cup honey, lemon juice and vanilla extract in a medium bowl. Feel free to add more honey or vanilla extract to suit your taste buds. Place the mixture in the refrigerator so it stays cool. Let the peaches cool, then scrape the peaches and all of their juices into the bowl of yogurt. Use a big spoon to gently fold the mixture together. 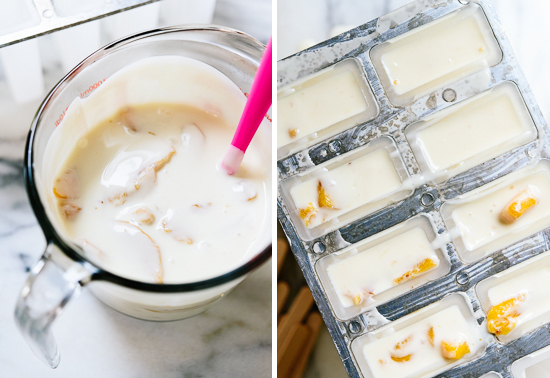 Use the spoon to transfer the yogurt blend into the popsicle mould. You might have to push the peaches down into the molds, but they shouldn’t put up too much of a fight. Insert popsicle sticks and freeze for at least four hours. When you’re ready to pop out the popsicles, run warm water around the outsides of the moulds for about ten seconds and gently remove the popsicles. Enjoy immediately. 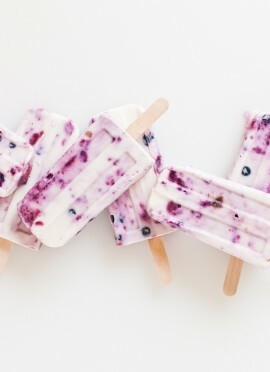 Recipe adapted from my roasted berry and honey popsicles. Recommended popsicle mold: I love this American made, BPA-free ice pop mold. If you don’t want to buy a mold, I think you can use Dixie cups or empty, individual yogurt cups (like this). These look so good! I have made several popsicle recipes lately that I have posted on my blog. I never want summer to end! Peaches + honey = a classic combination that I could never get enough of. And I’m happy to have any excuse to eat up dreamy, creamy full-fat yogurt. These look incredible – the perfect grown up popsicle. Can’t wait to try them. I love how simple this recipe is. We love roasted peaches and look forward to the season every year. Adding them to a healthy popsicle is kind of genius. These look amazing! I have some push-up popsicle molds and I must admit we haven’t branched out beyond homemade fudgsicles. 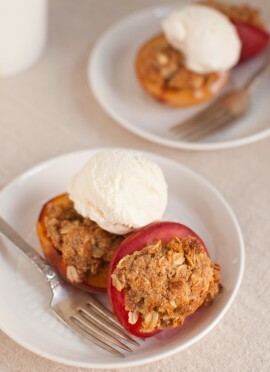 ;o) We ate our last peaches at breakfast but as soon as I get some more I’m making these! Can’t wait! Could not agree more – begone icy popsicles. Although not sure about the ice rubbing thing will have to pay attention next time haha. Roasting peaches to get rid of the water- what a great idea. And where did you get those popsicle molds from? They look like exactly what I’ve been looking for. Thanks, Allyson! I got the molds on Amazon. I added a link to the mold in the recipe notes! Perfect looking frozen soldiers. They look so creamy and delicious. I will have to try the recipe. Bravo on such beautiful pictures. Thanks so much for the shoutout Kate! You were such a fun guest! I had such an awesome time chatting with you! 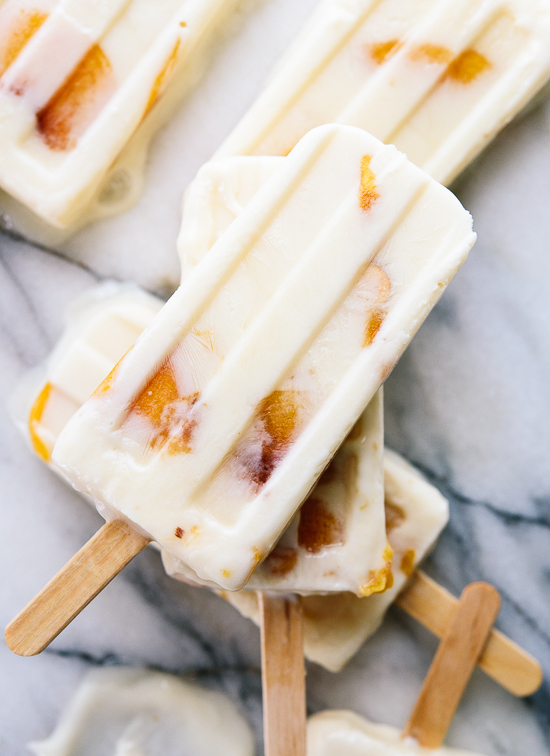 And these yogurt pops – love how the peaches are peeking through the frozen goodness! I am a full fat yogurt purist in ALL THINGS. I just don’t think anyone ever got fat from eating full fat yogurt, of all things! These popsicles are summer glory at its finest. Oh Kate – when these popped into my inbox I couldn’t believe my eyes. I’m certain we just don’t have iced lolly makers that look like this in the UK – if we do, they’re hiding from me! These look stunning, I also love that they’re made with yoghurt. I adore ice-cream, but it really doesn’t like me, so it’s nice to have something with yoghurt instead. So yummy, I want to try them! I’m feeling the same way about summer produce! Enjoying every last piece of it since I know fall is just around the corner. These look incredible and so easy (win/win)! I agree, full-fat yogurt all the way for frozen treats. I have noticed the days are getting shorter and it’s making me sad! I’m not ready for summer to end. These Popsicles look like the best way possible to hold onto to what’s left of it. Your pictures are gorgeous. I’m drooling just thinking about how good they must taste! Lovely recipe Kate! And nice interview too! I’m not a fan of large fruit chunks in my yogurt, frozen or otherwise. 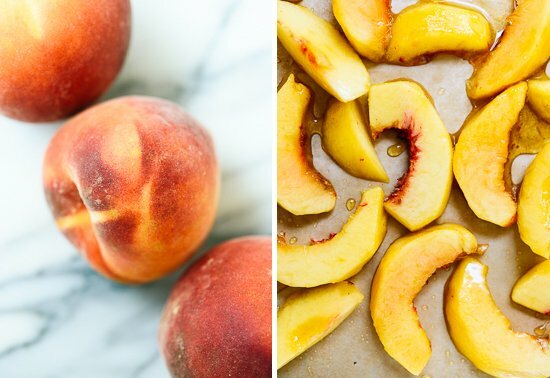 Would this recipe work as well if I puréed the peaches after roasting? Hi Melissa! Yes, I think they’d be great that way. 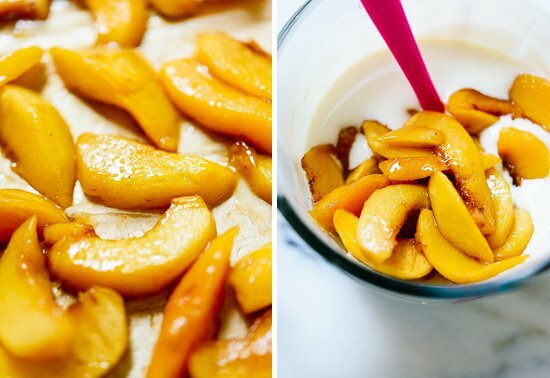 You might roast an extra peach just to make sure the blended yogurt tastes good and peachy. I recently found myself with 20 pounds of peaches and immediately thought of making popsicles! So glad I came across this recipe. They turned out amazing and make for a great afternoon treat. I love your recipes. We need more healthy recipes. These look so charming, delightful and mouthwatering! What a great flavor combo! Thanks, Ada! I hope you love them. Hi Kate, I made strawberry yogurt Popsicles with no fat Greek yogurt and he was a little icy, but that’s not what I don’t like.. I just don’t like the tang of yogurt. I wanted to taste like vanilla ice cream.but I’m watching my calories so I can’t use cream. I love the idea of coconut milk and I’m going to try it and let you know. Love your blog it looks so pretty. Yes, I think you’d like this one, Joan! Let me know how it goes. I really like your recipes and have tried a few. So thanks for the tips. I was wondering if i was able to give you a tip in return. I noticed in a few of your pictures that your popsicle sticks are not straight. I’ve been making popsicles for a few years now and use the same moulds you are using. I’ve found the best results and cheapest way to keep them straight is to use small and medium size chip clips. I’ve been able to find them at the dollar store and work great. That’s a really great tip! Thank you for sharing, Chris. I appreciate it! I really like this recipe but I used my fresh rhubarb instead. I roasted it just like the peaches. A bit tart but could have used a bit more sweetener. Saw in your “What to cook in July” post that no one reviewed this recipe yet and so I thought I’d leave one. It was a high of 95 the other day here in Ohio so nice cold popsicle sounded terrific and luckily I had everything I needed for them. Everything about this recipe screams delicious and boy did it deliver! The popsicles have a lovely tang but also a hint of sweetness and are very refreshing on these blazing hot summer days! Thanks for the great recipe! Thanks for reviewing, Samantha! I appreciate it. I cut the recipe in thirds and made these for my toddler using mini pop molds. Turned out creamy and excellent! Thank you for all your wonderful recipes you have a beautiful dog. God bless both of you. How old is your dog now? I wish both of you a wonderful day. Made these – so delish!